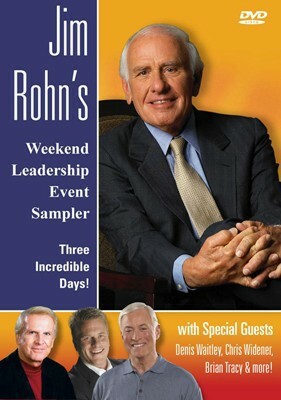 Special Offer - 2 1/2 hour DVD set containing highlights from the Jim Rohn Weekend Event - the Jim Rohn Weekend Event DVD Sampler ! We have taken the best of each of the 12 DVDs (24 hours total) and captured it on 2 DVDs and 2 hours of highlights! This is the perfect opportunity and way to share the 2004 Jim Rohn Event with your downline, staff, co-workers, friends and family. These are highlights of The Jim Rohn 2004 Weekend Event with special guests Denis Waitley, Brian Tracy, Chris Widener, Donna Krech, Jerry Clark, Charlie 'Tremendous' Jones, T.C. Cummings, Vic Johnson and Robert Helms.